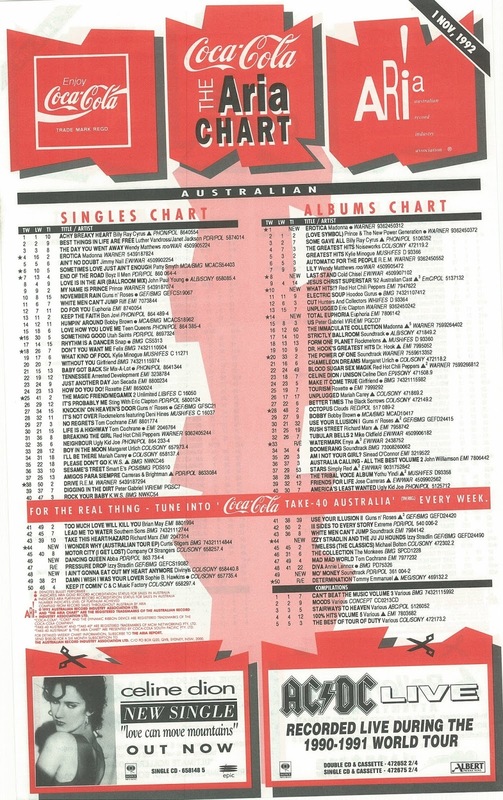 As you scan down the list of songs making their presence felt on the ARIA chart this week in 1992, let me assure you that I am talking about the top 100 from 1992 and not 1976 - the year when two of the week's new entries were originally released. Why were two songs from 16 years earlier back in the chart? Blame the impending Christmas market and the flood of greatest hits albums that spawned re-releases of former hits to promote them. 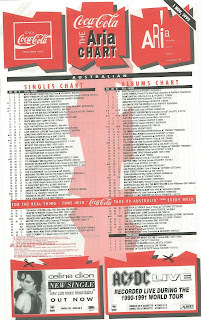 For one of the classic tracks, it was its first time inside the Australian top 100; for the other, it fell some way short of its eight-week run at number 1 back in 1976. A song in the midst of its seven-week run at number 1 was still on top this week in 1992. "Achy Breaky Heart" by Billy Ray Cyrus refused to budge for a fifth week. A pop/dance remake of another chart-topping song from the '70s, this revamp of Gerry Rafferty's 1978 number 1 single took Undercover all the way to number 2 in the UK. Another '70s cover! Recorded by Fatback Band in 1975 (as "(Are You Ready) Do The Bus Stop"), the formation dance classic had last visited the chart in remixed form in 1987. This version by Australian duo Nu-Q didn't reignite the craze. Not a hit in 1976 - their first top 100 appearance was 1977's "Pretty Vacant", which reached number 52 - the punk band's debut single was re-released to promote the Kiss This compilation. Besides her hit Disney duet, Celine Dion had peaked just outside the top 50 with the two other ballads that had so far reached the ARIA top 100 for her. So how would an upbeat number fare? About the same, it turned out. The fourth single from her self-titled album also just missed the top 50 despite being her best song of all time (according to me). The perky track was written by Diane Warren, who it seems was also taking a break from the power ballads with "Love Can Move Mountains". Entering the top 50 two places above the other hit from the Buffy The Vampire Slayer soundtrack is yet another cover version. A brand new recording from Divinyls, "I Ain't Gonna Eat Out My Heart Anymore" was a remake of the debut single by The Young Rascals, which had reached number 47 in 1966. For Divinyls, it was their biggest hit since the juggernaut that was "I Touch Myself" and would end up on 1993's compilation The Collection, which would contain two other new singles and an odd assortment of other tracks. The success of Erasure's ABBA-esque EP earlier in 1992 made it clear the tide had turned as far as the public's attitude towards the Swedish four-piece was concerned. More or less ignored since the conclusion of their recording career a decade earlier, it was suddenly OK to like ABBA again. And so hit-packed best of collection Gold: Greatest Hits was compiled, which in Australia had a different tracklisting to include songs that were successful here but not in other parts of the world. To promote the album, ABBA's signature song was re-released - I'm presuming the first time one of their singles was made readily available on CD single or cassingle. An eight-week chart-topper in 1976, "Dancing Queen" was not ABBA's biggest hit in Australia - that honour falls to 14-week number 1 "Fernando" - but the disco delights of "Dancing Queen" have made it arguably their most enduringly popular song. 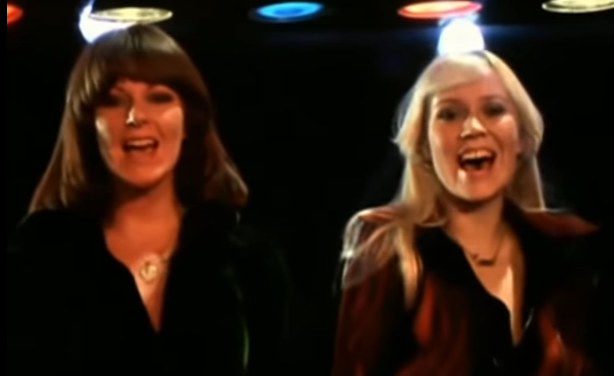 Also a number 1 smash in the UK and in the US (their only single to top the Billboard Hot 100), "Dancing Queen" is considered by many as ABBA's finest hour. And although it didn't exactly set the singles chart alight this time around, Gold was a phenomenal success, hitting number 1 for two weeks just before Christmas and remaining a steady seller ever since, with returns to the top 10 in 1994, 1999, 2008 and 2014. For now, though, the ABBA revival was officially on. In a week when most of the songs to look back at were either remakes or re-releases, it's fitting that this debut single by singer/saxophonist Curtis Stigers was also actually a reissue. Having peaked at number 92 earlier in the year, "I Wonder Why" was repackaged as a tour EP and given another shot. It came nowhere near matching its US and UK top 10 success, but at least this time the MOR ballad made it into the top 50. Next week: two more of 1992's biggest hits debut - including one of the year's most infuriating songs and a top 3 smash by a one-hit wonder duo. Plus, rockabilly makes a comeback. I read somewhere that bloke from Abba regrets using the word "diggin'" in Dancing Queen. So you should, mate. But since everyone in Australia is legally obligated to like Abba (and not doing so results in immediate cessation of Australian citizenship as per the Abba Act, 1976), surely this re-release shoulda got higher'n no.37?? ?